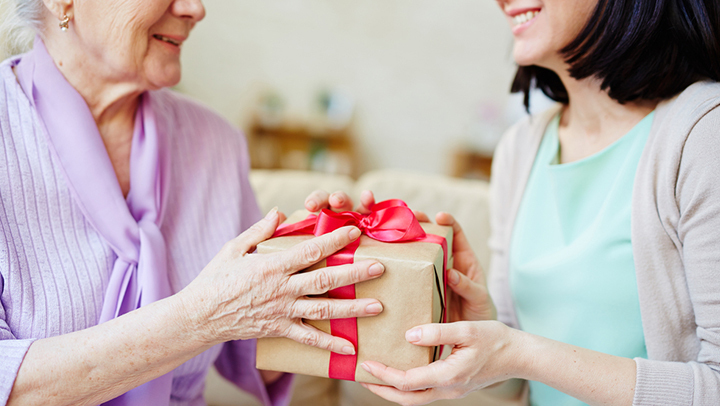 With Mother’s Day right around the corner, now is the time to think about getting something for your mother. It is important to let her know that you think about her and are thankful that you lucked out in getting her for a mother. In reality, all you need to do is tell her that; however, it is nice to give her something or spend time with her to let her know how you feel. Take Her to Brunch (or Lunch) Yes, you have lunch with your mom often enough, but take her to brunch or lunch somewhere that is special and a little more upscale than the usual lunch spot. If it is a really popular place for people to go for Mother’s Day, think about going early or making reservations. Better yet, gather the whole family and take mom out together to remind her of the good ol’ days. Give Her Pictures. Our residents love when they get pictures for gifts. Whether in frames or built into other collectible gifts, mom is like every other parent, she cannot have too many photos of her family. Get creative by going to a company like Shutterfly or Snapfish to have something made, whether it is a photobook, mousepad with a favorite picture on it, pictures in elegant frames, or creating a special photo collage of different family members to bring back family memories. This kind of gift typically sparks a lot of conversation and storytelling. Send or Bring Flowers. Whether you live in another city or even down the street, take time to send flowers to mom. Take time to add something special on the card. If you are local, take a few minutes to create a bouquet yourself with flowers at a local florist, or even take the kids with you and let them put it together. Take a Class Together. There are some fun day classes you can take, such as gentle yoga, pottery class, wine tasting class or painting class; the options are endless! If mom is at a Discovery Village community, you can join her at her favorite activity at the community. It’s important to let mom know how much you love her and appreciate all she has done for you over the years. If you are a mom, you love those moments with your kids and that feeling never goes away. When it comes down to it, time with family is the best gift anyone can give no matter the holiday. Have a wonderful Mother’s Day from Discovery Villages!